It’s no secret that the city of New Orleans likes to drink. Its famed Bourbon Street is notorious for being the rowdiest block in the world—filled with partiers, live music, parades, and beads almost 24/7. But drinking in New Orleans isn’t just about going wild. The spirit of the city really does shine through in its, well, spirits. Where you go to drink in New Orleans is just as important as what you drink. Whether you sit down for a perfectly made Sazerac or sip on an ice cold Abita, it’s almost guaranteed that the bar you’re sitting in has a fascinating history, and has had even more fascinating characters pass through it. Here are some of The Big Easy's most storied watering holes. This just may be the most historic bar in the country. On the outskirts of the French Quarter lies Lafitte’s, the oldest bar in America, dating all the way back to 1722. The blacksmith business was a front for owners Jean and Pierre Lafitte’s smuggling operation. Not only was this place a haunt for spies and pirates, it’s rumored to actually be haunted. Inside of the Hotel Monteleone, guests enjoy their beverages on an actual revolving indoor carousel bar. Their martinis are so divine that The Carousel Bar was a favorite of Ernest Hemingway and Tennessee Williams. 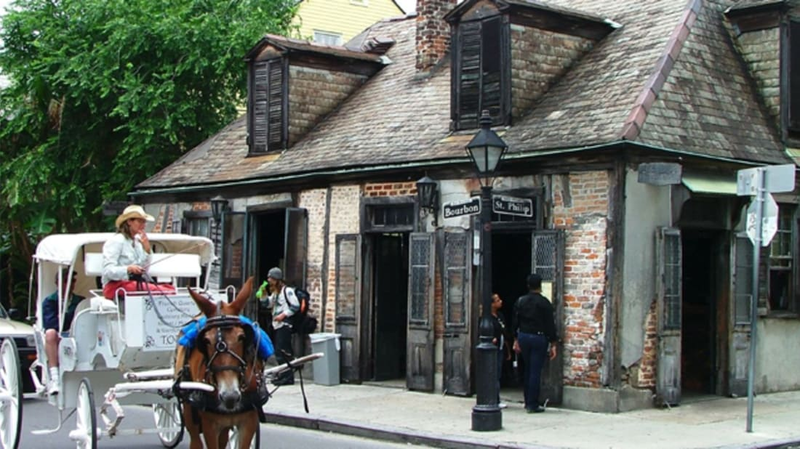 The second-oldest bar in New Orleans was the first bar in the city to introduce stand up bars—so folks on horseback could have a place to stretch and drink. Its restaurant has been one of New Orleans' finest since 1854 and has wined and dined many American presidents, including Theodore Roosevelt, Harry S. Truman and Dwight D. Eisenhower. This iconic Rampart Street bar is bursting with jazz history. Founding fathers of the genre, such as Buddy Bolden and Jelly Roll Morton, were regulars. It’s also where Louis Armstrong was arrested: On New Year’s Eve in 1912, Armstrong fired a pistol in the air and was sent to a home for troubled youth. Locals and tourists alike come to Pat O’s for two things: Hurricanes and the piano bar. This French Quarter staple, whose motto is “Have Fun! ", has one of the most gorgeous courtyards in the city. During Prohibition, Pat O’Brien’s was a speakeasy, but come 1933, it was immediately converted into a full-on bar. In 1940, the Hurricane was invented there and has been a fixture in New Orleans ever since. The building’s owner and former Mayor of New Orleans Nicholas Girod offered his home as refuge to an exiled Napoleon in 1821. Napoleon, who passed away later that year, never made it, although his moniker stuck. Over the centuries, the Napoleon House has been a favorite among artists, including Andy Warhol. Order the Pimms Cup while you’re there—you won’t regret it. Inside of the Columns Hotel is The Victorian Lounge. Built in 1883, the Garden District mansion contains one of the city's finest examples of Italianate architecture. The hotel and bar were designed by famous New Orleans architect Thomas Sully and The Victorian Lounge includes the only existing built-in breakfront by Sully. Not many bars are on the National Register of Historic Landmarks, so drink in the history while you’re there. The bar’s motto is, “Everyone you have known or ever will know eventually ends up at the Old Absinthe House.” Which is true for many travelers, as the bar has been around since 1807. The space still has its original marble fountains and brass faucets, which in the height of the jazz era were used to drip water over the sugar cubes that went into—you guessed it—absinthe. Once a meeting place for pirates (Jean Lafitte) and presidents (FDR) alike, a speakeasy “cafe,” and a corner store, this bar is oozing with history. Oscar Wilde, Frank Sinatra, and Robert E. Lee have all spent time at this NOLA lounge. If you’re looking for a locals-only bar with cheap beer and good company, then Henry’s is your place. It’s been around since 1900 and not much has changed since then. But the watering hole has a dark side: the summer before he killed JFK, Lee Harvey Oswald was a regular here.